"My process-based paintings are as unplanned as possible. I search to convey a feeling of immediacy and to enhance the very physical and tactile elements of my artwork. The presence and feeling of my hand is essential to the work and ultimately my focus." Nina Tichava was raised in both rural northern New Mexico and the Bay Area in California. She was influenced by her father, a construction worker and mathematician and by her mother, who is an artist and designer. The reflections of these dualities—country to city, pragmatist to artist, nature to technology—are essential to and evident in her paintings. 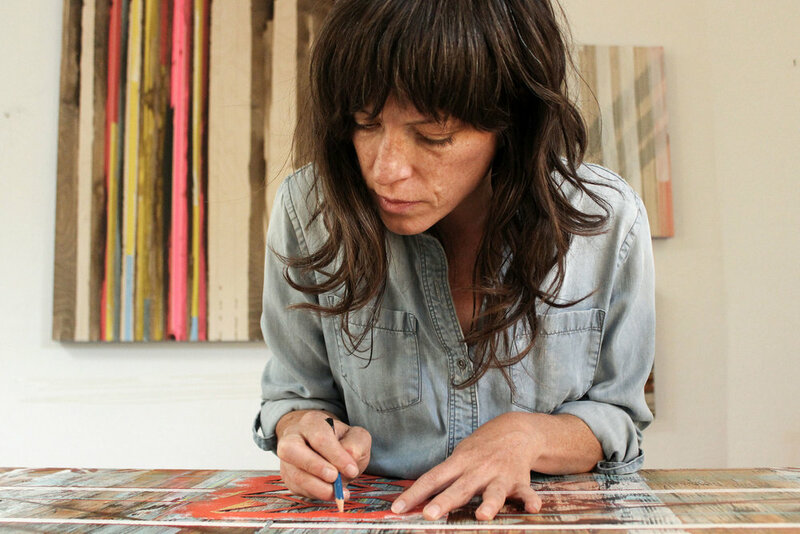 Nina is a recipient of the Pollock-Krasner Foundation Award Grant in 2007 and has exhibited professionally since 2009. She received her BFA from California College of the Arts [+ Crafts] in San Francisco/Oakland. My paintings are about relationships; I’m interested in the interactions between materials and methods as well as the color and spatial relationships that naturally develop in process. Using painting and printmaking techniques, I interweave drawing and collage with a variety of media. Simultaneously painterly and constrained, my paintings are composed of complex layers, many of which are over-painted and concealed. A prominent element of my work is the application of thousands of beads of paint, painstakingly and individually painted with a brush and used to create screens and patterns. I describe my work as “abstract painting with botanical and architectural references”, as the pieces suggest natural forms (birds, leaves, branches), man made structures (buildings, windows, lights) and patterning both natural and designed (woven fabrics, strata of earth, pixels). My works are emotional and imperfect, and as objects they embody my response to things mass produced and idealized. The paintings are collections of moments from daily life: combined glimpses, thoughts, memories and objects. I am trying to describe not only what things look like, but also how they might feel.